Garden Brothers Circus has been welcomed to the IcePlex at MCC. You can read about Garden Brothers’ lengthy record of animal abuse, neglect, and much more here. 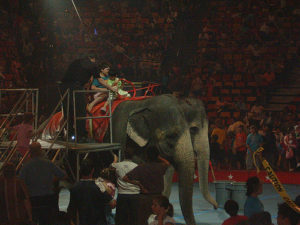 Please come out for as many as you can to show attendees that not everyone thinks the circus is fun for animals. ARRoc provides signs – to be sure there is a sign for you, please RSVP and indicate which shows, though late deciders are welcome. If you wish to make your own sign, please be sure its message meets ARRoc’s Core Values. Graphic images, which cause people to look away, may not be as effective as a clear, short, simple, written message, which people do read. Rain or shine. Dress for the weather. Umbrellas are fine. Consider bringing one more layer of clothing than you think you need, and consider gloves – your hands will be exposed for 60-90 minutes. Check our web site in case of dangerous weather. No bathrooms – come prepared!